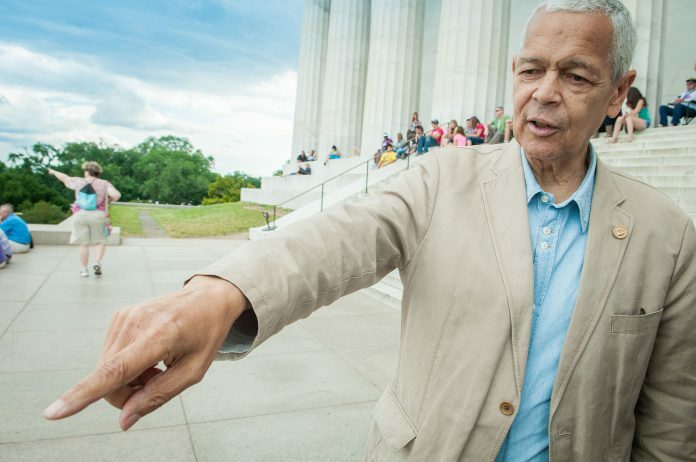 Julian Bond stands on the steps of the Lincoln Memorial during the making of the documentary "Julian Bond: Reflections from the Frontlines of the Civil Rights Movement." In 1974, when Calvin Smyre first won a seat in the Georgia House of Representatives, Julian Bond was among the very first people to congratulate him. Bond, one of the first African American lawmakers elected in Georgia nine years earlier, took the young black Democrat from Columbus, Georgia, under his wing—showing him the ins and outs of the Gold Dome, stressing the importance of personal relationships in a partisan building, and underscoring the need to study the political process. The door to Bond’s office was always open. Bond died last night in Fort Walton, Florida, after a brief illness. He was 75, and is survived by his wife, retired SPLC lawyer Pamela Horowitz; and five children, including Atlanta City Councilman Michael Julian Bond. The elder Bond leaves behind a legacy as a civil rights champion, an elected official, and a scholar. In the early ‘60s, Bond attended Morehouse College, where he helped found the Student Nonviolent Coordinating Committee, serving as its communication director, organizing voter registration drives, and staging rallies against segregated public establishments. He was among first outspoken activists to oppose the Vietnam War—issuing statements through both SNCC and even writing a comic book to express his views. After the Voting Rights Act passed in 1965, Bond became one of the first 11 African Americans elected to the Georgia General Assembly. But in a 184-12 vote, House lawmakers refused to let Bond take his seat because of his statements against the Vietnam War. Bond, one of eight black reps denied their seats, filed a lawsuit over the decision, which in 1966 prompted the U.S. Supreme Court to overturn the vote, ruling his right to free speech was denied. Once he took his seat, Bond went on to serve in the Capitol for 20 years—four terms in the House and another six terms in the Senate—before eventually losing a 1986 congressional bid to fellow SNCC leader John Lewis, who still holds the seat. Outside of politics, Bond helped established the Alabama-based legal nonprofit Southern Poverty Law Center, leading the organization as president from 1971-79; served as the NAACP’s chairman from 1998-2010; and worked on several documentary projects, including his work as narrator for the PBS series, Eyes on the Prize. From 1992-2012, Bond taught history at the University of Virginia, lecturing thousands of students about the Civil Right Movement, and leading bus tours to different civil rights landmarks. In Bond’s final years at the academic institution, University of Georgia constitutional scholar Anthony Michael Kreis spent two years working for the civil rights figure as a research assistant, helping him research voting rights history to help inform a speech for the NAACP’s 100th anniversary. Now a LGBT civil rights expert, in part because of Bond’s tutelage, Kreis says Bond remained devoted to understanding all aspects of the civil rights movement, even the parts he didn’t know about until late in his life. In recent years, Bond stood as a staunch supporter for LGBT rights, giving speeches on the importance of marriage equality; writing articles that compared “religious liberty” legislation to Jim Crow laws; and even boycotting Coretta Scott King’s funeral after her children held the services at an anti-gay church.